Happy Summer y'all! I know it's been a looooong time since I posted. While I'm not one for apologizing for my whereabouts, it has been since (hello!) November. I kind of morphed back into this thing called real life. The part where you go back to square one, get a job and get back in the saddle of mainstream Americana living. So I did that. I decided to move to a smallish country town (where I did all of my growing up as a child and teen). I've been here for few months now and have been becoming acquainted with how life is lived in a small town. Mind you I was a teenage kid when I left this sagebrush. It's a fairly different experience, this living in a small town now. I'm enjoying the good parts and remembering how denial works over the bad parts. For some time, I've been waffling over whether or not to blog again. There are many of parts of blogging that I don't miss, but then there's the part that I really want to be apart of again - namely reviewing sewing patterns and just talking sewing in general. I get so much from reading blogs that still do this and I enjoy getting excited over seeing someone conquer a pattern, try out different patterns companies or products, tell us all where they purchased this or that fabric, tips and tricks, etc. This is the part of blogging that makes it worth it to me. So here I am, back at it again. 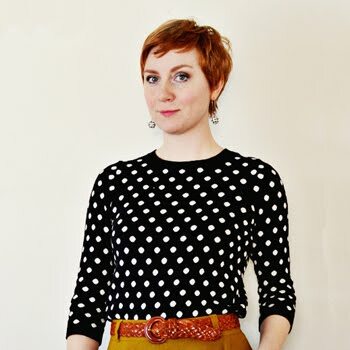 Before I move onto my version of the Ginger Jeans, please note that I am in the process of switching blog platforms. There's been some problems while doing this and right now I'm in the middle of uploading all of my old photos and reworking all of my old links, so if you're seeing missing images and the links within my blog aren't going anywhere, please bear with me. I'm working on it - slowly, but surely. Now, let's get back to the chatter of sewing! Yay! These are the Closet Case Files Ginger Jeans. For the longest time I've put off making jeans for myself. I would rather huck myself off a cliff sew something else than make jeans. Jeans aren't necessarily hard, but they are a little hard on my sewing machine(s) depending on the thickness of the denim. I've made enough to pairs to know by now. And I loathe dealing with the topstitching thread. It's just kind of a love/hate situation. 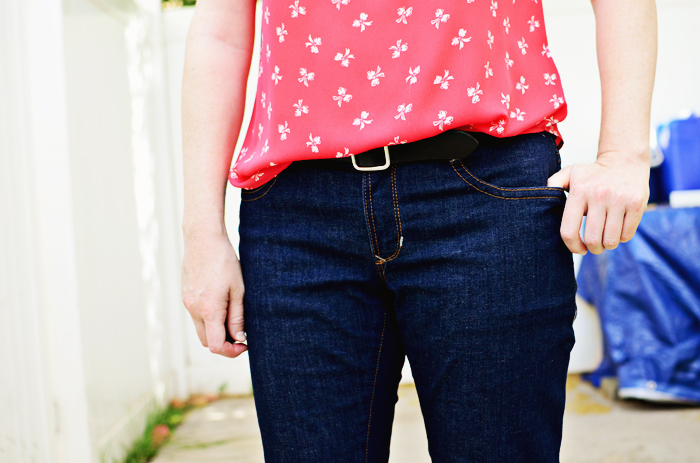 I love having good jeans that fit me, but sewing them is not as fun as other things in my humble opinion. My weight has fluctuated some in the last several months and well, I ain't as thin as I was when I was stressed to the nines in years past. A lot of my wardrobe has been feeling really snug lately. I feel I wear a tailored, fitted look as it is, so too much weight fluctuation and I feel like tight and uncomfortable. Note to self: make some more clothing that has a little more give. I've needed new jeans so bad for awhile now. I bought a lousy pair and can't even wear them I hate them so badly. So one day, I pulled out my copy of the Ginger pattern and just went ahead and cut my size out of some stretch denim that I had in the stash. These turned out better than I could have hoped for. There are a few fitting issues that I need to address in the next pair, but I'm very impressed with the fit on my particular body straight from the envelope. I cut a size 10 and added 1" seam allowances to the inseam, outseam and top edge of the waist (the pants, not the waistband) just in case I needed extra for adjusting. I didn't use any of the excess on the inseam and outseam, but decided to go with the higher rise in the pants that came from the 1" seam allowance there because it felt good at the time. Next time, I'm going to deepen the curve of the bum - I have a pretty low hanging bum and there are more wrinkles at the bottom of my bum than I prefer. I would prefer zero wrinkles there, but for such a snug fit in a stretch jean, I feel that's probably next to impossible, but by golly we'll try to get rid of them! For the first time ever, I'm experiencing a bit of leg twist in a pair of pants. To combat that, I feel that the inseam is set much too forward for me and I'm going to move it 1 - 1 1/2" toward the back. Additionally, I'll move the outseam forward by about an inch. The front rise is a little on the high side after all is said and done and I'll lower that just a smidge (like 1/2"). I'm feeling pretty good about this pattern on the first try. I should have known given that I didn't have to alter the Carolyn PJ pant at all! For the most part, they do seem like they were drafted especially for my lower half. 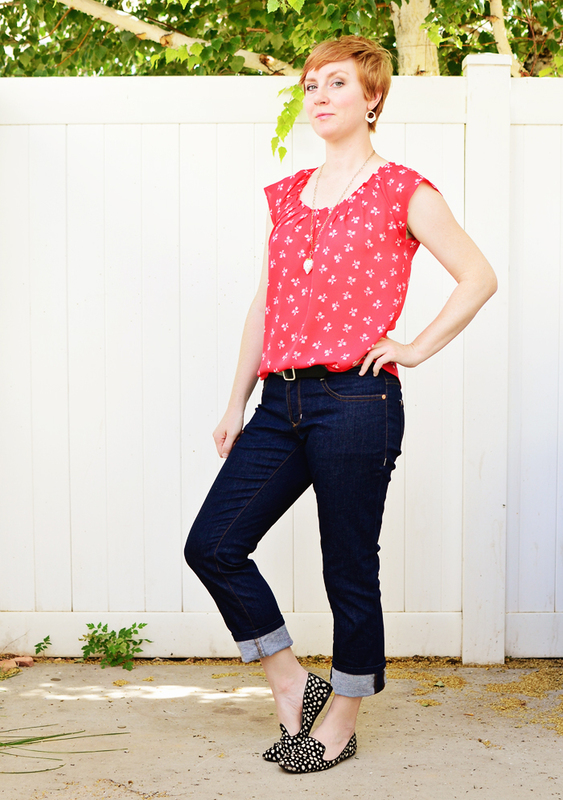 Click here, for my full pattern review of these jeans. Have you tried the Ginger Jean? 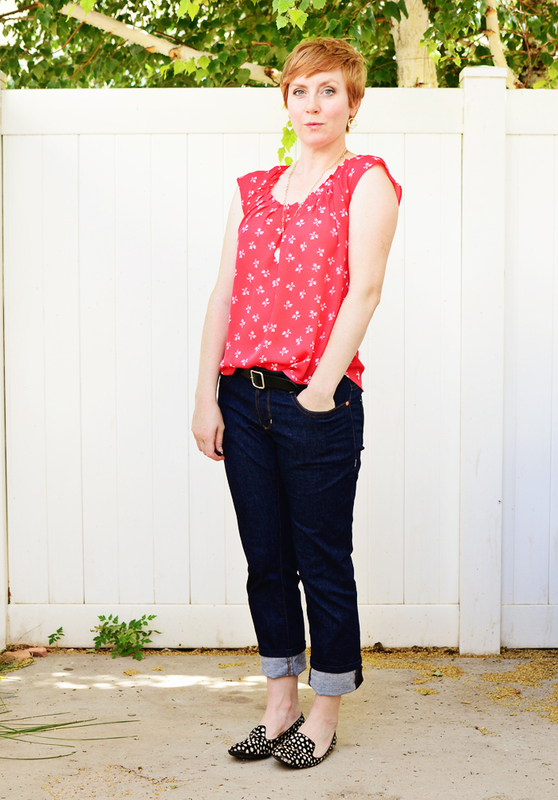 Do you sew your own jeans? So good to see you back! I've always loved reading about your projects. Thanks for the review. I've never sewn jeans yet. But maybe soon! Welcome back! So looking forward. Your post is so timely, especially as Ive been missing your blog! I've just ordered denim for Closet Case Morgan's. I hope they look as great as your Ginger's do. I just ordered them too!!! I was so thrilled with the fit of the Gingers that I thought I should definitely have the Morgans. Woot Woot! Hello! Very interested to see the alterations you make - I have very similar fit issues on my jeans. Then I will make a point of showing the alterations I make to the paper pattern with the second pair which is due to be cut out sometime in the next day or two. I love your whole outfit! Thanks so much for blogging! I've missed you! You were my biggest cheerleader back when I was working on the Japanese coat book. How you ever found my silly blog I'll never know, but suddenly sewists all over the world started watching my progress. I'm sure I'm not the only one who's been touched by your sewing generosity. It's so good to see you back. Thanks Duane! You make the most amazing menswear I feel everybody should know! Very much looking forward to getting back in the saddle. Hope you are doing well! So GREAT to see you back posting, Sunni!! Life changes sure zap the blogging mojo, don't they? Your Gingers look great! You look great! Thanks Debbie! Yes, life changes do zap blogging mojo! Couldn't agree more with that. Yay! So great to get a post from you again! Love how your jeans came out. I hear ya on the waffling about whether or not it's worth the effort to sew jeans. My machine is definitely not a fan of all those thick layers. I think I have a similar "low hanging bum" so I'd be very interested in seeing how you alter for this! Thanks lisa g.! I'll make sure I post my alteration for this problem. That second pair of Gingers is going to be cut out soon! So happy to hear from you again! I had wondered if you were coming back to blogging - I've learned so much from you in the past. Great jeans, and nice to have you back! I missed you! Glad you are back! I love your jeans and always loved your blogging style and learned a lot reading yours. I NEED to cut my denim and make the Gingers, not sure why I haven't done it yet. And, I love the top you are wearing with your jeans, looks so comfortable for summer. Thanks jsews! The top is from Kohl's and while they probably don't have the exact same textile print, this top is usually available. It's in the Lauren Conrad section. Nice to see you back. I enjoy your blog. Your outfit looks great. I'm starting (again!) to try to get a decent fit in trousers. I'm less bothered about jeans but will get around to them eventually. Looking forward to seeing more of your makes, and gleaning from your wisdom. It's so good to read one of your posts again. I am glad to hear that you want to keep blogging. Your posts were always ones I looked forward to reading. And, I'm glad you decided to go ahead and make your own jeans. They look great! I hope they wear as well as they look! Thanks Amy! They are wearing well. They are quite comfortable which is the best part as my others were getting quite tight. I am definitely a creature of comfort! I'm so glad you've returned to the blogging world! I always enjoy reading your posts. Great jeans! Good to see you blogging again. Your jeans look great. Did you make your top? Yes, I am wondering about your top, too! It's so cute! Hey ladies! The top is from Kohl's. While they probably don't have this particular print, they always have this style. It's in the Lauren Conrad section of the store/online. I'm happy to see you again! I have a quick suggestion for your next pair. I've always gotten leg-twist on my Gingers, but with the last pair, I was really careful about stretching them where Heather says to. That eliminated the twist for me. I love yours, they look great! Thanks for the advice Denise! I'll look into that too. I think mine is definitely more of a problem with where the inseam and outseam are sitting on my body. I was even looking at them today in the mirror and just noticed that the outseam isn't hanging straight. I'm definitely altering my pattern. Oh do it! It will be one pair closer to getting a perfect fitting jean! I'm so happy to see you back here on your blog! Your Gingers look so nice with minimal changes. I would love to hear more about your adjustments, especially moving the inseam. I feel like I need to do the same thing with mine. The legs aren't twisting but I feel like the inseam is too far forward on my leg compared to my RTW jeans and it's noticeable when I walk. I'm looking forward to seeing your next pair! Yes, I'm definitely feeling the twist when I walk - especially going up and down stairs. 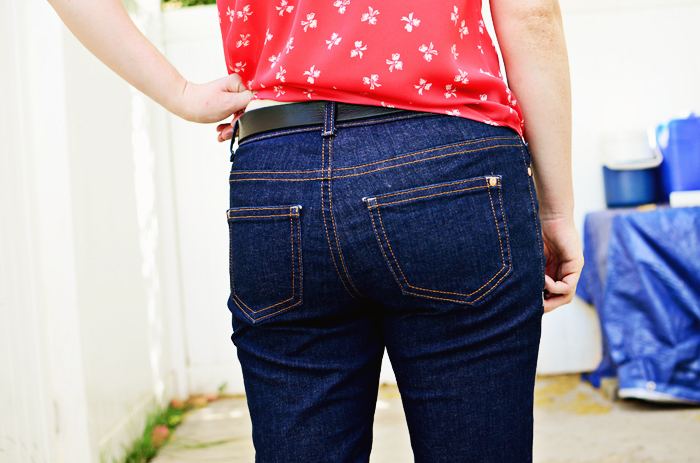 I'll give a show and tell of my adjustments in my next jeans post. Awesome I can't wait for that! Really cute! I don't wear jeans so I don't sew them but yours turned out so cute it almost makes me want to start lol. Hi Sunni! Nice to see you back! Your jeans look brilliant! I've still never made a pair of jeans but I'm just making my first pair of shorts (excluding PJ shorts) so maybe trousers/jeans will be soon! I've missed your pretty ginger pixie and lovely style! These jeans look awesome, and perfectly styled! I also appreciate reading helpful sewing posts that review patterns and still talk sewing! So good to see you back! I found your blog about a year ago and read it from beginning onward--thank you for continuing! Whenever I feel stressed about blogging, I remind myself that first and foremost it's supposed to be a journal, for me, to record my sewing (triumphs and, um, not so triumphs), as well as the annoying things I'll forget later, like what alterations I did. That being said, I've always loved reading your stuff and I'm happy to have you back to whatever extent you're interested in it. Oh, and the jeans look great. I really need to make another pair... All of mine are getting pretty ratty. So happy to see you back Sunni! I use your blog archive extensively for all the helpful tutorials, alteration demonstrations, and fabric know how. I can't wait to see what else you can share with us. Welcome back, Sunni! I hope that things are settling down for you :D These are looking great for a straight out of the box fit! Thank you for sharing! Happy you are back! And glad you will be reviewing pattern and giving fit tips along the way. I have not tried the ginger Jean pattern but it's on my to do list. GREAT to see you're back Sunni! It has been a long time! Anywho lol I've had this jeans pattern for quite some time now and thanks to your long awaited post I have to try it...no more excuses! They look great on you by the way! Don't be gone too long again...please! 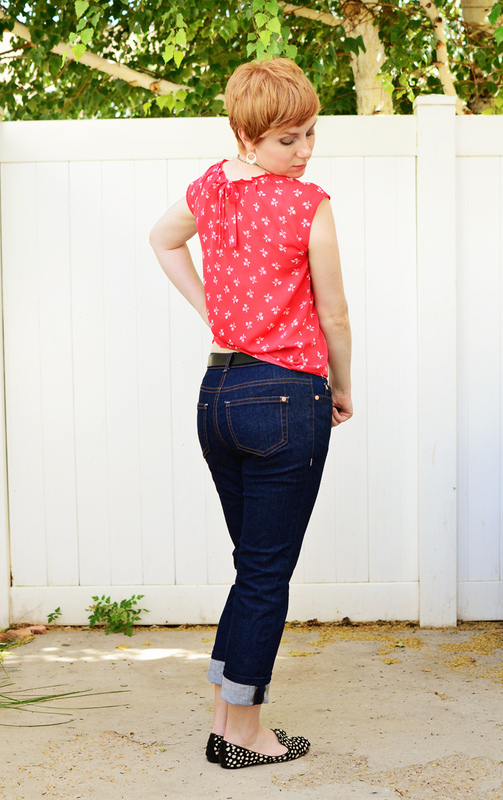 I made a pair of jeans last month, the Liana Jeans by Itch to Stitch and the fit was perfect with no changes for me, this is unheard of! I need to make another pair now, but will have to change it slightly as the new fabric has less stretch. Good to see you back Sunni. I missed your posts. Glad to see you back! I'm glad these jeans worked out for you, I've always been really intimidated to try sewing a pair of jeans. So glad to have you back blogging. I have never tried a pair of jeans and tend to just but used Madewells on eBay. 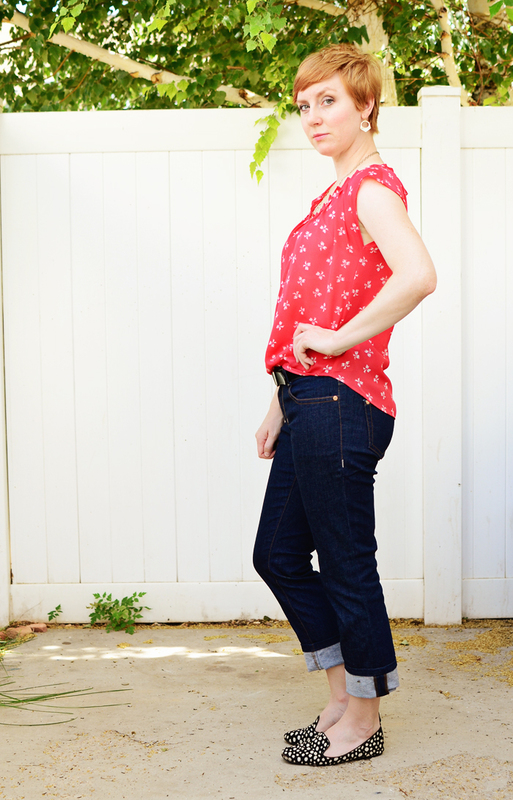 But I sure do love stretch denim jeans and bought a pattern and have it somewhere. I am interested in why you went back to Blogger. My daughter keeps trying to get me to change to Wordpress. I am going to look forward to any posts you have on making jeans because it's not something I wouldn't try. Hope you enjoy blogging and sewing again. Small business is tough. I have enjoyed and learnt a lot from your technical knowledge and enthusiasm. Well, I missed your return blog post until now for some reason. I am so glad to see your purty face! I have always enjoyed your blog immensely. It combines fun with learning, and it doesn't get any better than that. Welcome back!